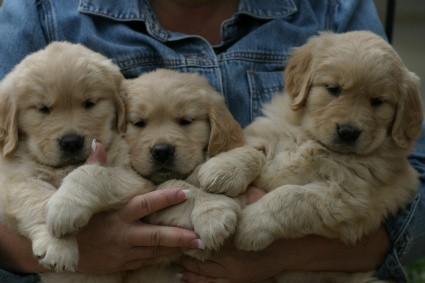 We consider each of our puppies to be precious family members, and are committed to assuring that they all become part of equally dedicated families for their entire lives. Our questionnaire is one way that we work toward this goal. Thank you in advance for taking the time to send your answers to us. If you feel that any additional information would be helpful, please add it to the bottom of the form. All information is kept confidential and used only by the Breeders/Owners of the litter. We thank you for your cooperation and interest. Why have you decided to purchase a Golden Retriever? For what purpose(s) are you purchasing a Golden Retriever? If "no", what kind of arrangements will you be making for your new puppy? If yes, when and what breed? all of the following necessary clearances before breeding? Please name 2 person (s) that we could contact for references (name, email, phone number). Do you have a veterinarian that you have used and trust? Please give the name and phone number of that clinic. I understand that sending this application does not automatically entitle me to a dog. I understand that this application is just a beginning step in the interview process. All of our companion or pet puppies are sold with AKC Limited Registration and spay/neuter contracts. This means that the dog is registered with AKC, however none of the offspring are eligible for registration. A dog with a Limited Registration as well as a spayed or neutered dog can compete in all AKC events except in the Conformation classes (breed ring). contact you via Email as soon as possible regarding the availability of a Stellar puppy.